Home » Learning BJJ Faster » How can I learn Brazilian Jiu-Jitsu faster? 1. Keep a journal – Write down what you learned in class. Even if you never read it again, the act of gathering your thoughts and visualizing the move as you put it on paper will help you retain the knowledge. 2. Watch instructionals – The BJJ instructional market is huge now, and these days you can find videos by top instructors teaching almost anything. Pick a technique, position, guard, or gameplan, then go study it. You’ll still need to drill it–watching isn’t the same as doing! 3. Study competition footage – YouTube has hours and hours of high level tournament footage, and more live events are being streamed on-demand. Find a good match and see if you can breakdown the key moves. 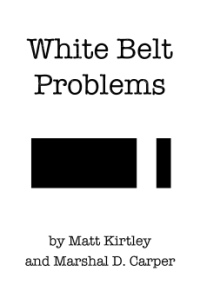 Many black belts say they learn more from watching matches than from what’s taught in class. 4. Find a BJJ role model – Pick a black belt with a similar body and game to yours, then study their instructionals and tournament footage. You don’t need to reinvent all of grappling–you just need to find what works for you, and odds are someone out there can show you. 5. Compete in a tournament – Win or lose, competing will teach you a lot (maybe even more if you lose!). Your training leading up to the tournament will sharpen your jiu-jitsu as you refine your best moves and cut out what’s unneeded. 6. Create a gameplan – Having a bunch of moves you “know about” is useless if you aren’t any good at them. Laying down what you do–maybe by drawing out a flowchart of positions and techniques–will solidify that knowledge and show you where you’re missing pieces. Then go drill it! 7. Do extra conditioning – A healthier, stronger, faster body is always good for BJJ. How you do it is up to you: lifting weights, swinging kettlebells, jogging, running, bike riding, swimming, yoga, rock climbing–whatever gets you sweating! 8. Team up with a good training partner – Make friends at the gym who will show up early and stay late to put in extra reps and rounds. Having an enthusiastic friend will keep you motivated, and you will push each other to improve. 9. Set goals – Big or small, setting goals will let you channel your energy in the right directions. Go into each class with something you want to improve. But don’t get so obsessed with the goal (like getting a blue belt!) that you stop enjoying the journey! 10. Respect your body – Eat right and get enough sleep. You can’t expect your body to stand up to the stress of training without giving it the nutrition and rest it needs to repair itself. But really, train more! None of this advice does anything if you aren’t stepping on to the mats!